This baroque stallion with some high school training was imported from Spain's prestigious Miguel Angel Cardenas stud. His breeder is retiring and offering up three incredible stallions and several mares. Clasico has been a flagship breeding stallion and is amateur safe. He represents world class bloodlines. He is not in consistent training, yet he is a safe & steady gentleman, and can be tacked up and ridden even with time off. He has some high school / upper level movements, including a brilliant, expressive piaffe and passage. His canter is amazing! 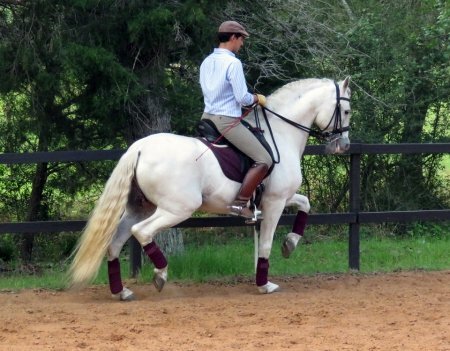 Clasico represents the old world classical style Andalusian. Sired by Clasico MAC, Champion of Spain and Qualified/Calificado by ANCCE. Dual registration in the USA and Spain. Available to approved home. Contact us for details and video links.